THIS WEEK’S OTHER FEATURED BOOKS, “THAT ONE MOMENT,” BY PATTY WISEMAN AND “NEW CITY,” BY SCOTT ABELS, CAN BE FOUND BY SCROLLING DOWN BELOW THIS POST, OR BY CLICKING THE AUTHOR’S NAME ON OUR AUTHORS PAGE. THE EDITOR: Michelle Proulx did some helpful copy editing. She’s also a writer. 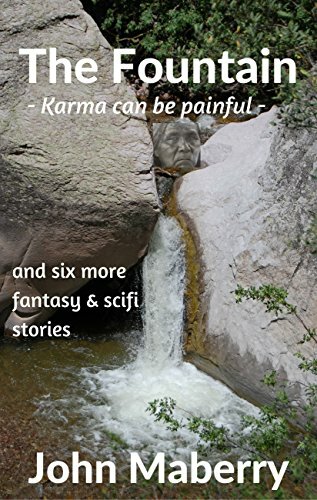 SUMMARY: A seven-story collection of fantasy and science fiction short stories. The back story offers more clues. Perhaps Through the Looking Glass, influenced “The Closet Door.” It’s set in coastal Maine, a place where the author’s family spent some time. Dan sees an unfamiliar face in the vacation cottage mirror—a parallel universe with a twist. The Outer Banks of North Carolina, another frequent vacation spot for the author’s family, is the setting for “The Flame.” He never saw any flames rising from the water but the thought popped into his head one night for a story line. Yes, Fribble rhymes with Tribble for all you Trekkies. But it’s unlike a Tribble. An odd first encounter, with a somewhat bored and burned out pharmaceutical company employee. “The Fribble” is a story that may be continued in a novella if popular demand ensues. WHY THIS TITLE: It’s the lead story in the collection—a modern day plunderer looking for fortune meets a long-dead shaman. Karmic consequences ensue. WHY SOMEONE WOULD WANT TO READ IT: Don’t have or want to take the time to read a novel? Then a collection of short stories allows easy stops and starts—on the bus or train, the waiting room or wherever. If you like fantasy or sci-fi, then this is for you. It has humor, twists and turns. A mix of times and places with current or retro themes and characters. AUTHOR PROFILE: John Maberry dreamed of being a writer from second grade. Life got in his way. He supplies details in Waiting for Westmoreland, describing how he came to have a happy and successful life. That, after surviving a hard childhood, failed marriages, an eye-opening year in Vietnam and more. He finished the memoir five years after retiring from a local government job in busy Northern Virginia. 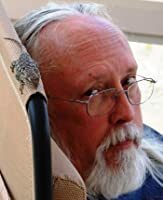 That’s John in the author photo, relaxing with his friend Larry the Lizard. He met Larry in Mimbres, New Mexico. John and his wife relocated to scenic New Mexico six years ago. That move and other priorities, stalled the transition to speculative fiction, mysteries and writing genres. Finally, The Fountain, a collection of speculative fiction stories, came out in July, 2017. He’s also working on a few novels, planning for one every one to two years. The first should be out for the 2018 holidays. No more delays; time is fleeting. AUTHOR COMMENTS: Finally on to fiction! The short stories were fun—indulging myself in varying subject lines, themes and characters. I like twists and humor. You’ll see if you read them. I had to get something out now, couldn’t wait any longer for the novel. I’m actually working alternately on several. Hard to just stay on one. But the one which I’m furthest along on will come out in late 2018, if the computer doesn’t break down or the creeks rise. LOCAL OUTLETS: It’s Kindle only; too short for paper so no outlets other than Amazon. But it’s available in all the countries Amazon serves. WHERE ELSE TO BUY IT: Nowhere else, sorry. PRICE: $2.99 but watch for three free days in August, the 25th, 26th and 27th.